Why bake your own sandwich buns? Because homemade is SO much better than store-bought. 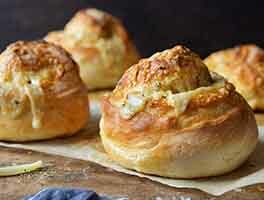 These soft, golden buns feature a subtle spiral of dried onion, giving them incredible aroma and marvelous flavor. They're perfect for all kinds of sandwiches — and hamburgers, of course. 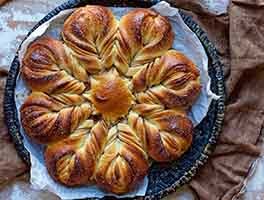 Read our blog about these buns, with additional photos, at Flourish. To make the dough: Combine all of the dough ingredients, and mix and knead themby hand, mixer, or bread machineto make a soft, somewhat tacky dough. Place the dough in a lightly greased bowl or other container large enough to allow it to at least double in bulk, cover, and let it rise for about 60 to 70 minutes, till it's just about doubled. Starting with a short (12") end, roll the dough into a log, sealing the ends and side seam. Place the buns on a lightly greased or parchment-lined baking sheet, flattening them to about 3" wide. Cover them, and allow them to rise till they're very puffy, about 1 hour. Towards the end of the rising time, preheat the oven to 375°F. Bake the buns for 20 to 25 minutes, until they're golden brown and feel set when you poke them. Beaten egg white/water will give your buns a golden, shiny crust. It also acts as glue for the seeds. If you don't like seeds on your buns, simply leave them off. For a soft, buttery crust, skip the egg white, and brush buns with melted butter just before baking, and right after removing them from the oven. When making yeast rolls or bread, let the dough rise to the point the recipe says it should, e.g., "Let the dough rise till it's doubled in bulk." 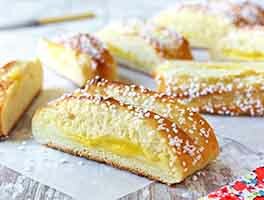 Rising times are only a guide; there are so many variables in yeast baking that it's impossible to say that bread dough will ALWAYS double in bulk in a specific amount of time. Fast and easy to make in a pinch. Mine didn't have the definitive 'swirl' top shown after baking, it was more rounded like a true bun; but it tasted good and we made sandwiches with them. I can see them making good burger buns too. I used dried onion flakes reconstituted for 10 mins in hot water to soften them. I love garlic so I might use my large garlic flakes like that too, next time. The rolls didn't crumble and fall apart in the hand like some do. We put a few halves in toaster; it was good that way too. Hope they freeze well, bc we put the 3 extras in freezer for another time. I made this to serve with ATK's best beef stew, and I should have doubled the recipe. They were so perfect and so easy! I wound up needing to add a little more than a cup of water on a cold day in March in Virginia. I let the bulk fermentation go on longer than the hour that was suggested to develop more flavor to no ill effect. Finally, I topped it up with some everything bagel seasoning (dehydrated onion and garlic flakes, poppy seeds, sesame seeds, salt) and cracked pepper. They came out beautifully and I wouldn't hesitate to make these again. These were fantastic! I added dried jalapenos to the dough and they were amazing. I froze all the leftover buns - wrapped individually in two layers of plastic wrap, then in a Ziploc bag - and they taste just as good as they did when they were fresh. I used them as hamburger buns one night and it made me never want a standard hamburger bun again! I highly recommend this recipe. I followed the directions exactly and they are perfect. I'm ruined for store bought onion rolls forever. I make all kinds of bread each week ( I made 2 diff kinds just today ) . With this recipe , I mixed this on dough cycle in my bread machine , then followed rising directions both in a greased bowl & then after shaped into rolls & let rise for an hr . The only diff i made is that I mixed onion flakes into the dough & after shaping them into rolls & letting them rise for an hr . I brushed with egg wash & added the poopy seeds and onion flakes to the top . I wanted to make sandwich rolls for my husband and children . They are so delish ! It really has the perfect flavor and texture . I will make these at least once a week . My way yielded 9 large ( bun size ) rolls . It was amazing! I used cranberry grape juice. Yummy and that smell! Mmmmm love it! Thank you! t! 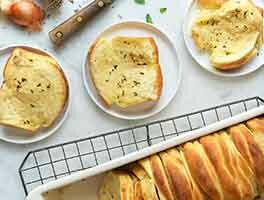 I made this recipe using my Zo bread machine. Rise time was about an hour longer than dough cycle. Excellent results! Mild onion flavor. Next time I will use sauteed onions. These rolls are easy to make and delicious. I made this according to the recipe, except I brushed the dough with soft butter (after rolling out the dough following the first rise, and before making into buns). I also added a lot more dried onions to the filling than the recipe called for. I did the water/egg mixture with a Toasted Sesame Ginger Seasoning mix I bought locally (it contains toasted sesame seeds, ginger, black sesame seeds, garlic, sea salt, red pepper, and toasted sesame oil) and the buns are fantastic! Absolutely wonderful!! The buns were done in 15 minutes so I will shorten the baking time on all future recipes. 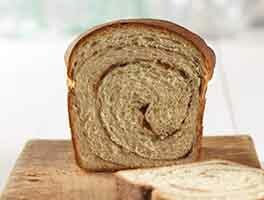 This recipe is a keeper and quite welcome in our regular bread/bun rotation!!! Thanks again KAF! 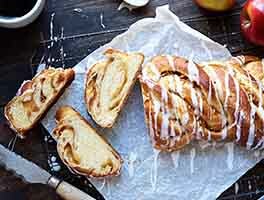 I love this site and the great suggestions from others who have tried and tinkered with the recipes! I baked these today and they are absolutely soft, fluffy and delicious. As I do not have onion salt, I finely minced a large green onion and added it to the flour. Brush the buns with water and pressed small fresh onion ring on TOP of the buns; turn out absolutely delicious.